Rep. Tim Walz joined fellow freshmen Democrats on Tuesday to demand that any new reconstruction money spent in Iraq be in the form of loans. At a news conference, Walz, D-Mankato, and others said Iraq must begin spending its oil revenues on national reconstruction and the fuel used by American forces. "We're losing our treasure, we're losing our youth, we're losing our military, we're eroding our readiness. The least the Iraqis can do is pay their fair share, fulfill their commitment, and let us move forward with the true fight, and that's in Afghanistan," he said. The issue will come to a head this week when the House is expected to take up a $183.7 billion supplemental war spending bill for the rest of this fiscal year and part of next year. Walz and other freshmen Democrats late last month joined in a unanimous call that reconstruction aid, training and fuel costs be paid out of Iraqi oil revenues. . . .
Felker notes that the President and many in the Senate object to the proposal, according to the ranking member of the House Appropriations committee, Ray LaHood. The Senate bill’s details were still being finalized, with most lawmakers and aides declining to discuss them. Still, some of the bill’s elements are taking shape. The wars in Iraq and Afghanistan are the first order of business. With the costs of the conflicts rising and the U.S. economy taking a downturn, members from both parties are increasingly talking about the need for the Iraqis, now awash in oil wealth, to spend more to help their country rebound. Several members of the Senate Armed Services panel would like to shift the burden of funding Iraq’s reconstruction to the Maliki government. Several also want A-Iraqis to pay the U.S. military’s fuel costs, as well as the salaries of former Sunni insurgents who are now helping U.S. forces fight al Qaeda in Iraq. Those senators, who include Democrats Ben Nelson of Nebraska and Evan Bayh of Indiana and Republican Susan Collins of Maine, would like to see U.S. funds for such purposes be provided to the Iraqis in the form of loans instead of grants. . . . The Minnesota Republican, facing what could be a tough reelection battle this year, joined a bipartisan group of senators Tuesday who are drafting a "sense of the Senate" resolution that would restrict future reconstruction dollars to loans instead of grants. "I do think it's important with the changing circumstances in Iraq," he said. "This is something that needs to be done." 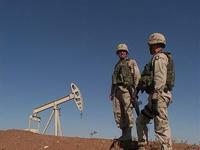 Coleman, who visited Iraq in January, said the nation currently produces 2.3 million barrels of oil a day. At $100 a barrel, he said, "that's close to a quarter billion dollars a day." The move reflects a growing consensus in Congress in reaction to the recent reports by U.S. Gen. David Petraeus and Ambassador Ryan Crocker about the fragile military and political gains of the past year's U.S. troop "surge." Members of Congress in both parties, eyeing Iraq's rising oil income five years after the U.S.-led invasion, are now seeking to minimize U.S. war reconstruction costs, which have totaled $47.5 billion since 2003. . . .
Looks like there's some interest in the concept in the Senate, regardless of what LaHood may have said yesterday. As you work with our colleagues to craft upcoming spending bills, we ask you to consider language emphasizing the government of Iraq’s cost-sharing responsibility. With so many competing priorities, from emergency domestic spending to funding for our national security, it is clear that taxpayer dollars will be stretched thin. As you know, with the amount of money that we have spent in Iraq, we could fund virtually every emergency domestic priority in this country, as well as fully fund the war against terrorism in Afghanistan. As new Members of Congress, we hope to be able to return to our districts with news that Congress is asking the Iraqi government to stand up for itself. Specifically, we hope that you will consider language in upcoming spending bills that requires the Government of Iraq to take more ownership over the reconstruction projects and training for security forces. Additionally, the Iraqi government should take responsibility for the $153 million per month that the United States Government spends on fuel in Iraq. Both the American and Iraqi people will gain from increased involvement of the Iraqi government in these endeavors. Whether our colleagues support or oppose the Iraq war strategy, we can all agree that when it comes to the $600 billion in American taxpayer dollars that we have spent over the last five years, we must find another way. American taxpayers are spending $339 million a day in Iraq. The amount of money we spend in Iraq each day could house 48,000 homeless veterans, hire over 2,000 new Border Patrol guards for a year or give 2.6 million uninsured Americans access to health care. We write to you in the hopes that you will agree that it is time for us to pursue this issue in a more fiscally responsible manner. Ron Klein (FL-22), Ed Perlmutter (CO-07), Chris Murphy (CT-05), John Yarmuth (KY-03),Hank Johnson (GA-04), Keith Ellison (MN-05), Carol Shea-Porter (NH-01),Harry Mitchell (AZ-05), Albio Sires (NJ-13), Paul Hodes (NH-02),Steve Kagen (WI-08),Mazie Hirono (HI-02),Kathy Castor (FL-11),Kirstin Gillibrand (NY-20),Joe Sestak (PA-07),Jason Altmire (PA -04),Tim Mahoney (FL- 16),Brad Ellsworth (IN-08),Bruce Braley (IA-01), Ciro Rodriguez (TX-23), Phil Hare (IL-17), Joe Courtney (CT-02), Nancy Boyda (KS-02), Steve Cohen (TN-09), John Sarbanes (MD-03), Laura Richardson (CA-37), Nick Lampson (TX-22), Tim Walz (MN-01), Patrick Murphy (PA-08), Chris Carney (PA-10), Mike Arcuri (NY-24), Andre Carson (IN-07) Betty Sutton (OH-13), Charlie Wilson (OH-06), Bill Foster (IL-14), Jackie Speier (CA-12), Dave Loebsack (IA-02), Yvette Clarke (NY-11), Heath Shuler (NC-11), John Hall (NY-19), Jerry McNerney (CA-11), Peter Welch (VT-AL), Gabrielle Giffords (AZ-08), Zach Space (OH-18), Nikki Tsongas (MA-05), Joe Donnelly (IN-02) Baron Hill (IN-09). "President Bush insists on war without end in Iraq, but Democrats in Congress stand with Americans who want to bring our troops home responsibly, safely and soon, and with taxpayers who believe that the Iraqi government must begin to pay its fair share for the reconstruction of their country. "With Americans confronting an economy teetering on the brink of recession and struggling to afford rising prices, we are extending unemployment benefits for those searching for work and supporting a new GI Bill to help make the veterans of the wars in Iraq and Afghanistan part of our economic recovery. "Democrats are putting rebuilding America on par with the President's priorities. We have crafted an Iraq plan the President should sign-and one that makes the economic needs of the American people a priority once again." Update #3: The Washington Post has more on the supplemental in Democrats Link Wishes to War Funding: Proposal Includes Troop-Withdrawal Timeline and Money for Veterans' Education.